Yes! I'm finally checking in on this blog after nearly a year. Of course, Chord du Jour has been active on Instagram during that time. I'll try to post a blurb here as often as I can. In the latter-20th Century, there was a rock band -- a duo, really -- called Local H, and they didn't have a bass player. Singer/guitarist Scott Lucas' friend modified Lucas' guitar and placed a bass pickup under the Low E and A strings, and output that signal through an octave pedal to provide the bass sound, in addition to the guitar sound. A Little Thunder is basically the sleek, 21st century version of the Scott Lucas' improvisation. 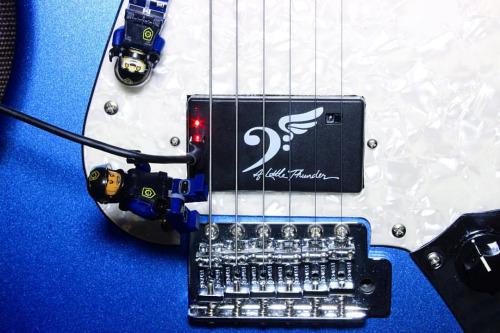 Invented by guitarist Andy Alt, the ALT pickup's octave effect is built-in, and there is a battery that can be charged with a USB cable. I can go on and on about the various features of the pickup, but it is better to listen to some samples for yourself. Throughout the summer and to this day, I have been posting 15-second live, one take, one-man band performances featuring A Little Thunder on Instagram -- hashtag ALTbass. Until the next post! Keep jamming!